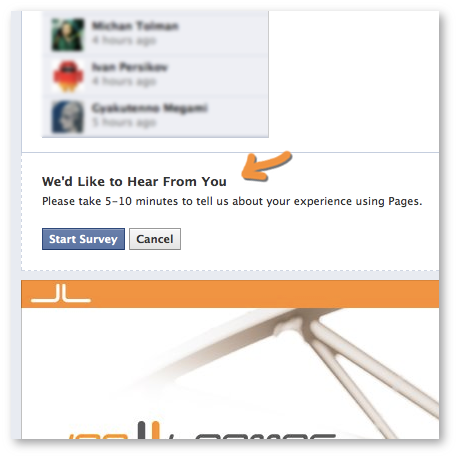 Survey: Would You Pay for Facebook Page Business Suite Upgrade Package? About a week ago, Hugh Briss of Social Identities was contacted about a user receiving a survey from Facebook about a premium suite of services for businesses with a suggested price tag of $50 per month. Later that day, Hugh posted a retraction, indicating that a source from within Facebook said the survey was unofficial. Such a survey — and an official one — wouldn’t have surprised me. I reported for AllFacebook.com on a very similar survey back in February for a “Boosted Page Posts” feature. Interesting, eh? But a fake wouldn’t have been shocking either. Then I started hearing more rumblings of this survey. And then, personal proof. This is an official survey. I don’t know how anyone within Facebook could deny it. I guess you could imply malware or adware, but I’m not a malware-susceptible type dude. The survey I received is identical to everything Hugh reported on, with one exception: A price point of $25 instead of $50. This is again classic Facebook. Multiple waves of surveys getting a feel for what people would be willing to pay. Which of the following best describes your role in making decisions regarding marketing and advertising for your company? Which of the following best describes your role in making decisions regarding the Facebook Page for your company? How satisfied are you with your business’ Facebook Page? What do you like about your business’ Facebook Page? Please be as detailed as possible. What do you dislike about your business’ Facebook Page? Please be as detailed as possible. Facebook is considering offering a suite of new Facebook Pages features designed specifically for businesses. On the next page, Facebook wanted to know how interested I’d be in learning more about these features. I know that what I’m about to say won’t slow the mob, but this is all new functionality. Facebook isn’t looking to charge you for something you’re already using. As such, it seems fair and even necessary. Yearly Discussion with Facebook Experts: Are these Facebook employees? Is it an exclusive Facebook conference of some kind? No idea. Prominent Listing in Search and Local Directory: What does this mean? Regarding search, are they referring to a Sponsored Result ad? Or something different? Or a completely new search? And what is this directory? Will it help get visibility? And why is it a “local” directory? I don’t know what any of this is, but it definitely has my attention. Leaderboard: Once again, no idea what this is or what it would look like. But apparently it could compare my Page to other Facebook marketing Pages or local Pages. Would this suggest a new method of Facebook Page discovery? It’s apparently not a Klout-like feature since you can get prominent position simply by paying for this service. Still… interesting. Additional Private Messaging: Currently, a Page can only private message when the Fan initiates the conversation. This would allow brands to private message once that Fan has commented or posted on your Page. Would users like this? I have my suspicions. Could open things up for spam, but I assume Facebook would crack down on it quickly (likely including taking away this service). Change the Name of your Page: You can technically change your Page name now, but there are hoops you have to jump through. It’s obviously not something Facebook wants to encourage. This would apparently give you more naming control as well as help protect you from others creating negative Pages about your brand (apparently). I wouldn’t be surprised if Facebook moved entirely to charging for name changes. Email and Chat Support: Email support exists now, but Facebook is notorious for slow and poor service. Chat support? Heck yes. Groups within Pages: This could be interesting. I have a closed Group now, but it’s of course outside of my Page. Could there now be a tab for a Group specific to my Page? This could presumably encourage discussion outside of my Page posts. Many have complained that the new Timeline discourages this discussion since Fan posts aren’t prominently displayed. Would you be interested in paying $25 per month for this service? How about $50? Let me know in the comments below!